I honestly should have called this series of posts the Stupidly Simple Valentines Ideas. 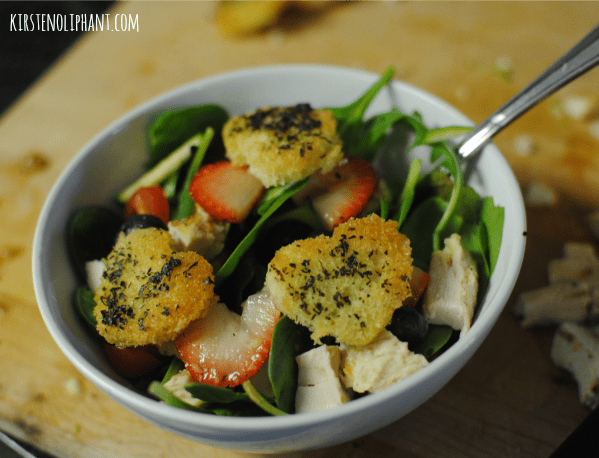 So far I’ve given you some cookies that look fancy (but aren’t if you can ice within the lines), fruit on a stick (on a heart plate to make it Valentines), and now this: a Valentine Strawberry salad that is pretty basic…with some heart croutons. 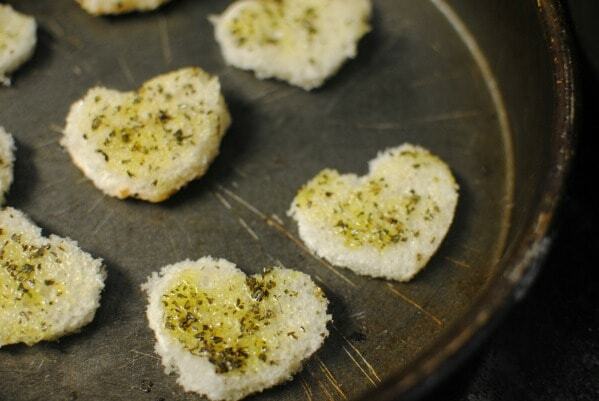 I totally LOVE croutons. Sometimes I have salad with my croutons. If you’ve never made them, no worries! Easy peasy. I don’t always think I’m going to like salad with fruit, but then I have salad with fruit and realize that sometimes I’m a real dummy. For this one, I used sliced strawberries and whole blueberries. That plus spring mix, arugula (I have a real problem with it), and fresh spinach. I also sliced some grape tomatoes and used freshly grated parmesan. The dressing was a simple oil and vinegar concoction (similar to this from All Recipes): 1/2 cup of olive oil, 1/4 cup apple cider vinegar, 1/3 cup sugar, 1/2 tsp salt, 1/2 tsp paprika, 1 TBS poppy seeds. 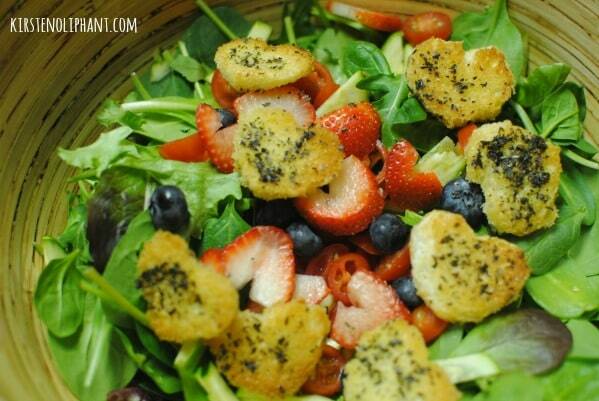 This dressing is sweet and tangy and great on any fruity salad. I am on a no dressing kick, so it’s not pictured. Now. The croutons. First, I should confess that I have been known to buy a bag of croutons (the Texas Toast sea salt and pepper ones are a fave) and eat them straight from the bag, like chips. I have a problem. Thankfully, it’s one that can be managed by eating a bag of croutons every so often. The correct way to make croutons is, I believe, on low heat in the oven, slowly. This girl doesn’t wait for croutons, so I choose to broil them on low, flipping over once. This is dangerous and often results in burning, so stick close to your oven. Pretend you are a Dance Mom and those croutons are your babies, destined for great fame, but only if you hover over them constantly. For these, I used 1 white baguette that I sliced long-ways into thin slices, then cut into heart shapes with a cookie cutter. (I also used the extra bits to make even MORE croutons, but they were less pretty, so not pictured.) In a small bowl I combined 3-4 TBS olive oil, 1 TBS basil, and hefty shakes of salt and pepper. I used a marinating brush to get each side, then popped it into the oven and hovered. When they started getting golden (2-3 minutes), I flipped them. Keep hovering. So pretty. So tasty. So stupidly simple. With amazing croutons. CROUTONS. 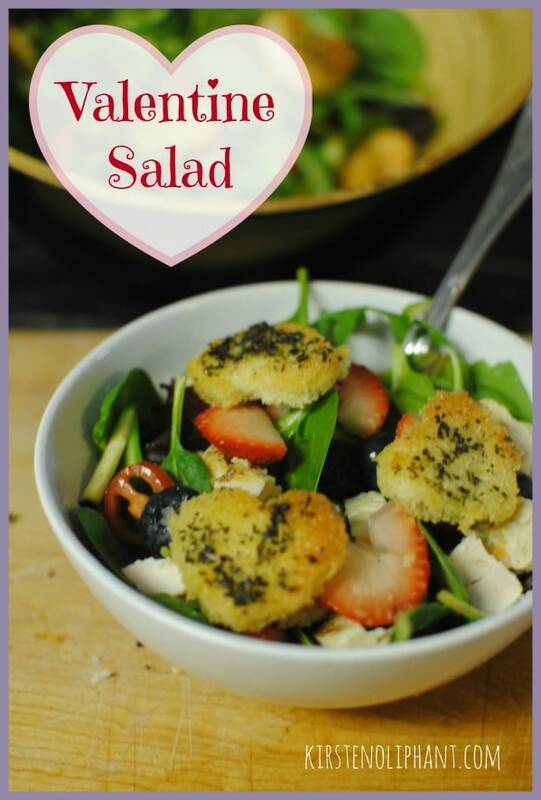 Sorry–I’m getting distracted.Valentine Strawberry salad: will help you avoid the onslaught of sweets surrounding this holiday. Or, will at least off-set them or absolve you of some guilt. How about you? Any Valentines ideas, stupidly simple or no? Ever tried making croutons or eaten a whole bag by yourself? We should start a club.